The way Trayvon Martin and George Zimmerman’s friends are treated on the stand, and by the public, has everything to do with race. 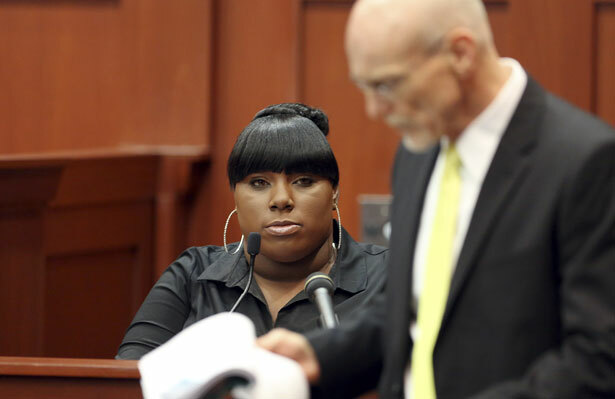 The media berated Rachel Jeantel last week throughout her testimony during George Zimmerman’s trial for the murder of 17-year-old Trayvon Martin. So much so that other media took to defending Jeantel—who spent much of her day on the phone with Martin, whom she had first met in second grade, the day he was killed. That kind vitriol and subsequent support were absent, however, during yesterday’s testimony, when Zimmerman’s best friend, Mark Osterman, took the stand. That distinction speaks to the way that race remains a central theme in this murder trial. No one denies that Jeantel does, in fact, have a drawl—one that could easily be confused with Paula Deen’s or even Mississippi Governor Haley Barbour’s drawls, which never drew public condemnation. In fact, in the mouths of white people, those southern accents are charming, and can even help fuel careers. Zimmerman defense attorney Don West (whose daughter, let’s not forget, posted a despicable photo on Instagram) repeatedly questioned Jeantel’s literacy on the stand. Despite the fact that Jeantel is trilingual, the court and the public—which is largely, and sadly, monolingual—displayed an obsession with determining the degree to which Jeantel can read cursive. Jeantel is indeed literate—but the question has nothing to do with her credibility as a witness in the first place. The attacks against Jeantel reflect an almost subconscious appetite for black destruction. Because the court—and the public—is not preoccupied with dissecting Osterman’s statements the way they were with tearing apart Jeantel’s, they took his testimony to mean that anyone who is not a convicted felon should carry a firearm. But, in fact, Osterman actually said that any felon should carry a gun, if they have not been convicted. Osterman, a white man who apparently profited from the killing of a child through his book, was granted understanding and latitude that Jeantel, a black woman, was not. One courtroom and one public have treated Martin and Zimmerman’s friends quite differently. And while the trial is clearly about the killing of Trayvon Martin, it is also profoundly about race, and about the way the public affords some privileges to some people, at the cost of detriment to others. Mychal Denzel Smith explains how George Zimmerman’s innocence rely on criminalizing a 17-year-old black man.